After one week of go, go, go in Port Douglas; we were off for one week of rest and relaxation in Fiji. As you have probably surmised from our earlier blogs, Bula is Fijian for “Welcome” or “Hello”. When one thinks of Fiji, we trust that one will likely think of visions of blue cloudless skies, white sandy beaches, swaying coconut trees, and tropical South Sea Islands. As you feel the warm ocean breeze on your skin, your ears will tune in to melodies of Polynesian music resonating with ukuleles, guitars, mandolins and Lali drums, which are hollowed-out trunks of trees of variable sizes that are played with hands or sticks. If this imagine conjures up dreams of romance in your mind, you are correct as Fiji truly is a tropical paradise. Unfortunately, once one leaves the tourist resorts, the imagines of paradise quickly wanes. 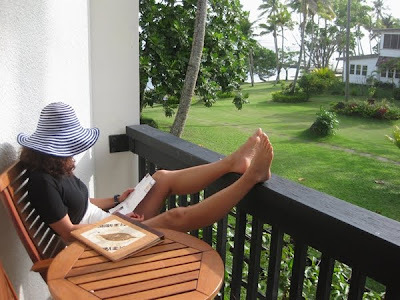 While Fijians may live in a paradise setting, the same cannot be said for their lifestyle. Fijians live in a third world country; that has many similar comparisons with Mexico. Let us explain before we tell you about our one week of seventh heaven at the resort. In the last twenty-five years Fiji, with a population of fewer than one million people, has been through four political coups, with the last government being overthrown by the military in 2006. The coups are largely a result of tensions between Native Fijians and Indo-Fijians who originally emigrated from India. 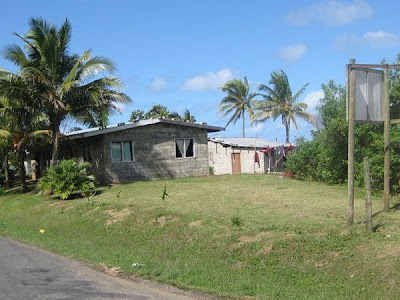 On one end of the scale, ninety percent of the land base is predominantly owned by native Fijian clans with no provision in place for land ownership by Indo-Fijians. On the other end of the scale, Indo-Fijians produce over 90% of the sugar cane crop, a major economic export for the country. The Indo-Fijian population has grown rapidly from the original labour force brought from India in the late 1800’s and early 1900’s to work in the sugarcane fields. Today they form the core of the country’s business class. The Indo-Fijians feel that the lease agreements do not provide adequate security to properly run their sugar cane businesses; with the result being that they have had a number of large boycotts within the cane industry, thus crippling the economy. Indo-Fijians continue to dominate the professions and commerce, while native Fijians dominate government and the military. Discontent between the two factions as well as high unemployment has no doubt been the catalysts behind the coups. 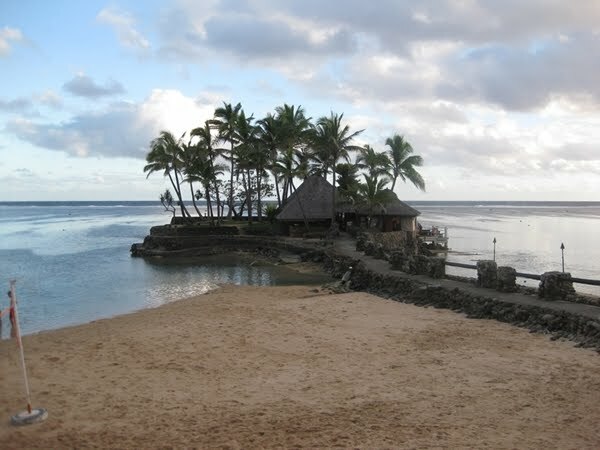 In addition to sugar export, tourism is the other half of Fiji’s economic base. 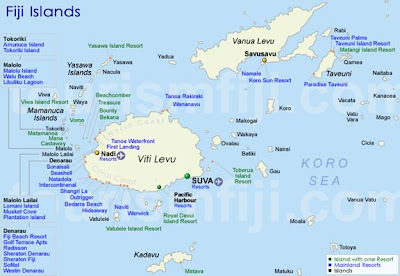 Fiji is comprised of over 300 islands, some inhabited; many not. Many of these islands have been developed solely for tourism. The recent coups have severely impacted the tourism industry as many Australians, who are the main source of Fiji’s tourist revenue, are still reluctant to travel to Fiji because of the unstable political climate. Consequently, Fiji is hurting economically and the country is trying hard to convince tourists to visit their tropical islands. While in Fiji we spent a day visiting Suva, the capital city of Fiji. We were quite surprised to see only a handful of other tourists in a city with a population of approximately 200,000. The absence of tourists leads us to conclude two things: tourists were not willing to leave their resort compounds for whatever reason and/or the number of tourists visiting Fiji is still low. Fiji’s dollar is quite devalued. Sixty-six cents Australian will buy you one Fijian dollar. You would think that as a result, goods would be inexpensive. This was not our experience as we found day to day living needs to be equivalent in price or dearer than the same product purchased in Australia. We wondered how the average Fijian managed as the standard resort jobs paid a meagre $3.50 per hour. Like Mexico, resort jobs are highly sort after by the public because they are considered to be well paying jobs. While travelling through the country side, house yards as well as brief glimpses inside homes left us with the impression that living conditions were spartan. A typical home. Do you think the bricks on the roof are sufficient to hold the roof in place in the event of strong winds? Services on the other hand were low-cost. A two hour local bus ride into Suva cost us approximately $8.00 Fijian. One of the experiences that we witnessed on the bus sadden us deeply and clearly reminded us that we were in a third world country. 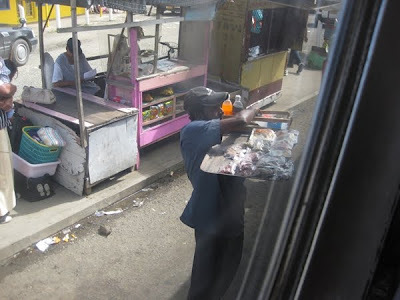 As we stopped at a local village, hawkers were outside the bus windows selling plates of food and beverages to the passengers. After many of the passengers bought their food and drink, we commenced on our journey. As the passengers finished their meal, they simply opened the bus windows throwing the styrofoam plates, plastic utensils, saran wrap, paper napkins and beverage bottles out the window. As you can imagine, the roadsides were littered with garbage and empty bottles. In addition to seeing the roadside rubbish, it was not uncommon to observe wild pigs, cows and horses roaming free alongside the road ways; oblivious to the passing vehicles. Does this sound like Mexico to you? We cannot understand how we did not see any animal-vehicle collisions. Hawker selling food and drink to passengers on the local bus. Also like Mexico, the resorts are a large employment sector for Fijians. Employees typically lived in villages located within one hour travel distance; with many of them having been employed by the same resort for their entire work career. They told us that they typically work eight hours per day, six days per week, with one week annual holiday time. When it came to annual leave, their tenure with the company had no special significance. Whether they had been employed for one year or twenty, they still were only eligible for one week of holidays. Even under these work conditions, whether it is at the resorts or in a town/city work environment, the Fijians proved to be happy people; generally with a smile on their face (such perfect teeth!) and a pleasant disposition. Many Fijians we talked to had family either in Canada or Australia. It was evident that the coups had resulted in an emigration of Fijians, particularly Indo-Fijians in search of better economic opportunities. Some of the Fijians told us that the only way they could leave the country was to join the military, marry a foreigner, be good at athletics, or be fortunate enough to be sponsored by a relative already living aboard. One unabashed young handsome worker within our resort openly told us that he was looking for an Australian woman who would fall in love with him so that he could leave the country. However, another worker boasted that he did not need to leave the country since the variability in origin of tourists coming to the resort resulted in the world coming to his doorstep! Most admitted that their life had improved considerably since the last coup. We could only imagine what life must have been like before. We stayed at the Warwick Resort, which is located on the coral coast half way between the cities of Nadi and Suva on the main island of Vitu Levu. Along the coral coast it seemed like each cove or bay housed a resort. Each resort appeared to be securely stowed away and distant from local towns and villages. Our nearest town was Sigatoka, which was approximately a ½ hour ride west of the resort. It seemed apparent that the resorts are located so that they remain isolated from local population centers. Consequently, the resorts have captive markets and the prices inside the resorts take full advantage of the situation. Cocktails cost $15.00 Fijian or when converted, $10.00 Australian. 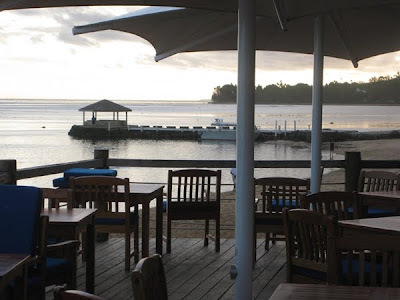 Dinners at the resort restaurants, consisting of an appetizer and main course as well as a single drink, typically were in the range of $150.00 Fijian for two people. Fortunately for us, we had made earlier arrangements to go “All Inclusive”. We think that the All Inclusive concept may still be relatively new with Australians as there were very few tourists at the resort who took advantage of this option. Given that the resort clientele are held captive and resort amenities and conveniences are priced accordingly, we thought that there would have been more people taking advantage of the “All Inclusive” option. Does All Inclusive sound like Mexico again? We have had the good fortune to be able to travel to Mexico on the “All Inclusive” package as well as “The Pay As You Go” option. In our opinion, either option you choose has its advantages and disadvantages. If you go All Inclusive, you don’t have to worry about any additional charges as all your costs are covered up front. The disadvantage to the All Inclusive is that you feel you should stay at the resort and not venture far because you have already paid for your meals, drinks and resort services such as the recreational facilities. Hence, you don’t venture far from the resort and don’t have the opportunity to visit local restaurants. Conversely, if you pay as you go, you experience the local environment more, may be more prone to “Montezuma’s Revenge” and should be prepared to pay “tourist” prices at local eateries that are situated near the resorts. Of course, the further you stray from the resorts looking for an eatery, the more reduced the prices become. Since it was our intent, while in Fiji, to just sit back and relax at the resort, we purposely took the All Inclusive package. After having arrived at the Warwick, we were very happy with our choice as we didn’t even have the option of eating at any local eateries without taking ½ hour bus ride into town. 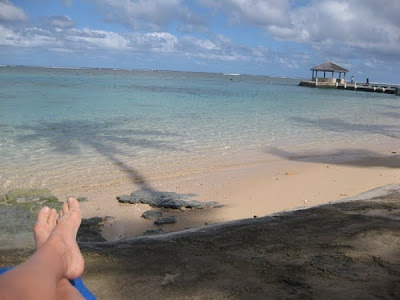 Other than our day trips to Suva and Sigatoka, our time at the resort was spent snorkelling in the bay, lazing in the sun, playing mini golf, going to the gym, taking in the nightly entertainment such as fire walking and enjoying the fine dinning in the resort’s three 5 star restaurants. Talk about a week of R&R! 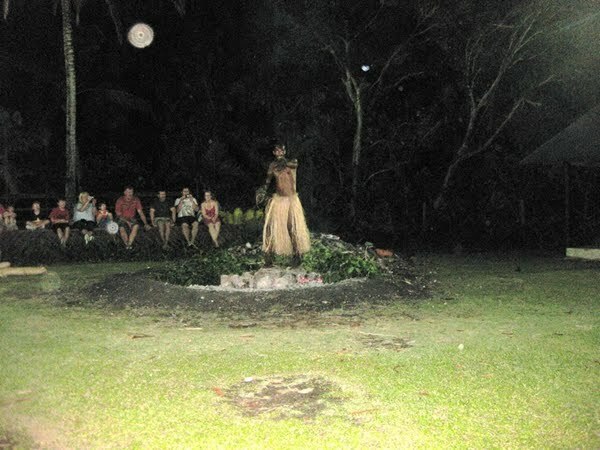 Fire Walking Show. Sorry for the quality of the photo, but it was total darkness after all!